No matter what you use your basement for, it’s important to get rid of basement mold because mold spores can make you and your family sick. Among other ailments, mold can trigger asthma attacks. Some people also want to keep their basements free of mold because they want to use their basements for entertainment, for play space for their children or simply for storage and don’t want their belongings to become moldy or mildewed. Mold in basements is not uncommon, though, since basements are often somewhat dank and damp. Mold in basements can also look unsightly and smell bad. You may find it easier to simply prevent the development of mold in your basement in the first place rather than to get rid of basement mold once it develops. Make sure any windows are watertight and that there are no leaks in the foundation. Get any such problems professionally repaired; otherwise conditions will remain ripe for mold in basements and efforts to get rid of basement mold will be of limited effectiveness. You can also purchase a dehumidifier for your basement. They are not too costly and they keep basement air dry, not conducive to the growth of mold. 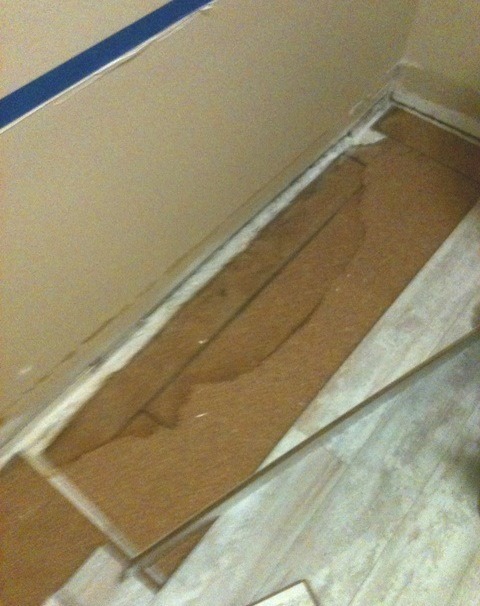 They will help prevent mold from developing but will not get rid of mold if you already have a problem. If you already have a mold problem in your basement, you’ll need to get rid of the mold, but then you can take precautionary steps to prevent mold from developing again in the future. If you already have a mold problem in your basement, you can take steps to clean it up. Just how hard the job will be depends on the extent of the problem and the affected surfaces. Hard, nonporous surfaces can be scrubbed with a non-ammonia cleanser. Some sources recommend using a mixture of bleach and water but that may damage painted surfaces and also the fumes may cause some respiratory problems for you. Bleach should only be used on non-porous surfaces. Less firm, more porous surfaces like sheetrock, drywall or carpet may not come clean with scrubbing. 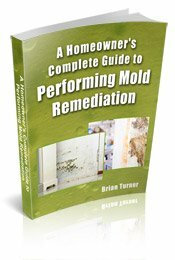 You may need to remove moldy materials and replaces them with new, mold-free materials. That may be the easiest way to get rid of basement mold. 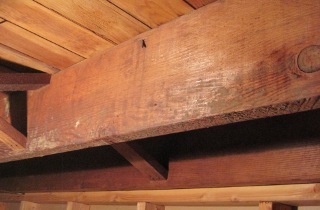 Wooden supports like in the picture above, should be scrubbed with a mold cleaner, and then encapsulated. Professionals may try to sand the wood to remove all of the mold, but that's too big of a job and not recommended for homeowners. Wear protective gear when you take steps to get rid of basement mold. Mold spores easily become airborne, especially when you’re disturbing them in order to clean them up, and inhaling them can lead to all sorts of health risks: asthma attacks in people with asthma, even the development of asthma in people that did not previously have the condition, upper respiratory infections, coughing, sneezing, sore throat, headache, fatigue, trouble concentrating and depression. When cleaning up mold in your basement, you need to wear a respiratory mask (N-95 model), protective eyewear such as goggles, long rubber gloves and long-sleeved shirts and long pants that you will launder as soon as you’re done working in the mold-affected area. You may also want to play it safe and wear a surgical cap and shoe covers. You definitely do not want to track mold spores into the rest of your house where not only you but other members of your family will also be affected. When removing moldy material from your basement, you don’t want to just carry it through the house where mold spores can scatter everywhere. If you have basement windows, you can pass carpet, drywall or other material you must remove and replace through the window so you don’t have to carry it through the house. If passing it through a window is not an option, enclose it in large plastic garbage bags to carry it through the house. And don’t forget to launder your clothing as soon as you’ve completed the job. The pictures below show mold on a vapor barrier that was not installed correctly in a basement. 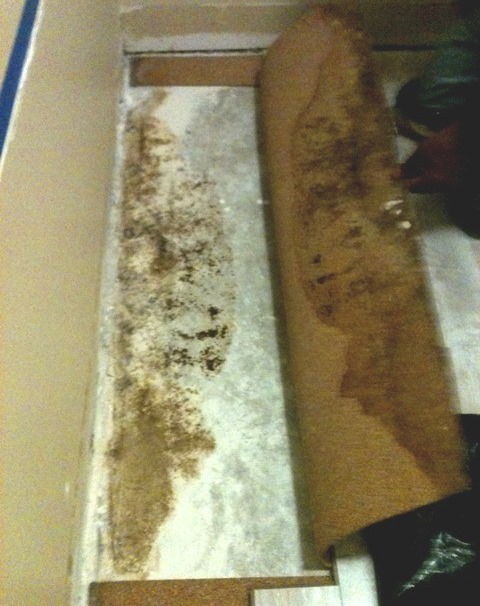 When mold covers only a small surface area and is found on non-porous surfaces, do-it-yourself mold removal is fairly simple. Unless you have health problems that might be negatively affected by exposure to mold, such as respiratory or immune system disorders, you can probably handle the mold removal yourself if you like. If you have mold on porous materials, like drywall or carpeting, we recommended consulting with a professional before attempting to remove the mold. Most mold removal professionals offer free consultations, so they will visit your home and assess the situation at no cost to you. Then you can discuss the work that needs to be done and decide whether or not you need professional assistance. If you have mold in your heating and air conditioning ducts, or if you have health problems that might be negatively affected by exposure to mold, having a professional mold removal specialist handle the job is probably in your best interests. To locate a mold removal professional offering free consultations in your area, just follow the link.